I want you to imagine an American inspired by Harry Potter wanting to put their own spin on it. Something which likely began as fan fiction, imagining if Harry and his friends were older, their issues ranging from depression to the need to succeed, and maybe even taking some elements of the X-Men into play. With that in mind, you get a taste of The Magicians. In what seems to be modern times, within our world, there is someone named Quentin (Jason Ralph). He is like many a young adult in media who lives in NY. He is a bit self-loathing, anxiety ridden, a bit depressed, and seemingly addicted to learning to postpone actually doing something with his life. But, when it comes to people like his friend Julia (Stella Maeve), the biggest issue of Quentin is his inability to let go of childish things, like what brought them together: Fantasy and magic. Now, I should note Julia and Quentin aren’t together, though it seems at one time Quentin could have stood a chance. However, his inability to grow up seemingly made him less desirable, and yet Julia couldn’t just leave him to his own devices. So, she stuck around and seems to be one of Quentin’s main supporters. But then the death of the man Quentin was supposed to be interviewed by to get into Yale, a page of a manuscript for this book called “Fillory and Further” floating off, and then an elevator going in the wrong direction. With those two events comes the introduction of Brakebills University, and a test involving the abilities of these two, among many others, to use magic. Something Quentin passes with flying colors, while Julia fails. Though she almost unrightfully fails. For while the first test of Brakebills is a bust, it seems she can force herself to use some sort of magic, it is just it requires pushing herself to her limits it seems. Yet, despite not being on Quentin’s level, someone out there in the magic world notices her and takes her under their wing. As for Quentin, he gets accepted and finds himself encountering strange things and people. Perhaps the two biggest things being a girl named Jane (Rose Liston), who he thought was but a character in a book, pushing him to question his new university, and not walk the beaten path. Then comes what one can only assume is Charlie (Ben Esler), brother to Alice (Olivia Taylor Dudley). Now, Alice herself is one of the top students of Brakebills and has a lineage of Magicians. But magic isn’t necessarily the main reason she is at this university, nor continuing the legacy of her family. If anything, she wants to learn what happened to Charlie 5 years ago. An answer not revealed in the pilot, but perhaps you may understand why the boy had to go missing. While I will say most of the characters we meet do seem familiar in ways which make you almost want to call this a rip-off, as time goes on you become interested enough in them to not care. For example, while Quentin screams to me “I’m like Harry Potter if American McGee wrote my story!” After a while, this slips away. Not because Quentin strays away from having people act like he is the chosen one, and then deal with a Lord Voldemort type, but because he has just enough of a differing storyline to present the appearance this story is unique. For with the sister of the “Fillory and Further” tales haunting Quentin, there is a break in the Harry Potter comparisons. Though I could go on with how others also fit into a slightly warped version of many characters you may be familiar with. With this show not being focused on young adults, leading to it being PG-13, or whatever the TV equivalent of that is, there is this sense of real danger. For with how the episode ends, with us seeing someone use dark magic, and there being blood, it almost becomes like that magic series perhaps never really done before. I mean, I’m sure Harry Potter (which will often be referenced), went to dark places and wasn’t the sole mainstream media tale about witches and wizards, but being that most of the media isn’t aimed toward adults, doesn’t feature issues like what Quentin is going through, nor presents a level of violence past people flying around, and dying without serious visible injuries, I think that is what may make The Magicians ultimately stand out. Right now, a part of me feels the only non “on the fence” thing I can really pick on when it comes to this show is what I guess could be considered token diversity. For while the Dean of Brakebills is Black, and Quentin’s roommate Penny (Arjun Gupta) is desi, the rest of those who seemingly will have speaking roles are all rather pale. Which only is a negative for me since I would love to see a show like this, with characters like Quentin, Julia, Alice, and the others, who were people of color. Have you ever watched something and felt how heavily inspired it was by similar media? For me, I felt that with this show. For between X-Men and Harry Potter, you can tell this show borrows elements from those two media in crafting its characters, and perhaps its story. For with Alice, a part of me sees Hermoine in her, yet with her parents both being magicians, and her less friendly than Hermoine, you can see this attempt to perhaps pay homage, but not rip off. Then comes this weird mix of this dude who approaches Julia almost seeming like a Magneto type. One who knows she was rejected by the mainstream school, and takes her under his wing and begins to build the loyalty and trust needed to manipulate them. All the while, there is this dark evil force which awaits our hero in Quentin who is currently a faceless evil, one who can perhaps only be stopped by this chosen one who everyone has heard about, and sometimes is spoken about in whispers. As the praise and on the fence headings note, and repeat onto themselves, the main struggle of this series will be breaking away from the quick and easy comparisons which can be made. Which I believe it can do by taking advantage of what SyFy offers as a platform. Of which, the main thing is being able to cater to adults, and really explore what some may call “mature” themes. For while depression, and things of that nature, are present in the Harry Potter franchise, at the same time some things were curtailed to keep it commercial and so it could nearly fit into a PG-13 rating. 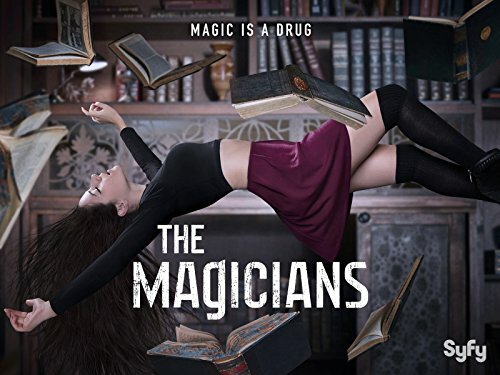 With The Magicians, though, the best bet for this show is to do the things the Harry Potter films couldn’t. Whether it be through violence which is more than killing curses and people being flung, or really exploring emotions and issues that maybe relatable for a teen, but fit more appropriately for someone in their 20s, there is a way for this show to make it. The only question is, at this point, how far is it willing to go to break out and stand on its own merit?